In the mid 1700's an Arab Amir took on the military might of Dutch colonials occupying Iran's Kharg Island, capturing their fort and liberating the southern Iranian cities from colonial rule. This Amir, called Mir Mahna, is an Iranian national hero. And now he's a video game hero as well. Shipping this week to local stores courtesy of Iranian developer ESPRIS Studio in collaboration with the Iran National Foundation of Computer Games, Mir Mahna is the first Iran-produced computer game honoring the life of a contemporary Iranian hero. It's Iran's equivalent of Medal of Honor, and perhaps it's also a way to spread the rich historical legacy and culture of Iran to gamers around the globe. The story of Mir Mahna is perfect for a video game treatment. In the mid-1700's the Persian Gulf was a brewing storm. Tension between the colonial forces of The Netherlands and Great Britain were steadily rising as both competed for influence in the region. It was during the height of this tension that the Dutch established a trading post and fort on Kharg Island, a strategically sound location positioned some 16 miles off the coast of Iran. The true importance of Kharg to Iran wouldn't be evident until some two hundred years later. Soon after World War I, great quantities of oil were discovered in the Persian Gulf, and Kharg became not only the world's largest offshore crude oil installation, but the principal sea terminal for Iranian oil as well. Iran's been slowly rebuilding the facilities after they were damaged in the 80's Iran-Iraq War. The island remains a location of paramount importance to the country to this day. But Mir Mahna didn't fight for the oil hidden beneath the waves surrounding Kharg Island. He waged his battles so that the island that belonged to his people would belong to them once again. The Dutch Empire established its presence on Kharg in 1753. In 1766 Mir Mahna and his forces took the fort and ejected the colonials, freeing the region from foreign rule. And so Mir Mahna is considered one of Iran's great national heroes. His life and battles have been famously chronicled in the "On the Red Marine Roads" books by Iranian writer Nader Ebrahimi. It is Ebrahimi's fictionalized version of the Amir's life that serves as the foundation for the Mir Mahna game. It took a team of twenty more than two years to complete Mir Mahna, marrying traditional Iranian music with modern game development techniques, including motion capture. The end result is a first-person shooter that casts players in the role of members of Mir Mahna's army, taking on the Dutch with muskets, throwing knives, and cannons. It's no Battlefield 1766, but it certainly looks capable of readily engaging fans of the genre. But the impact of Mir Mahna extends well beyond simple entertainment. During a ceremony honoring the game's creators earlier this year, Iran's Minister of Culture and Islamic Guidance Seyyed Mohammad Hosseini stressed the importance of computer games to the country's culture. "The inspiration of the computer game from national figures is a very auspicious event. It is necessary for us to introduce our heroes and luminaries to new generations." In fact, Mir Mahna's creators believe the game could reach beyond the borders of Iran, introducing the culture of the country to the world at large. In an age where much of the world perceives the Middle East as a place to which troops are deployed and from which oil comes, any product with the power to provide a deeper understanding of Iran to other cultures is a welcome one. And what better teaching platform than a video game? The interactive and immersive nature of games give them the power to break down cultural barriers far more readily that books or television. Experiencing an important moment in the history of Iran from the perspective of a warrior that was directly involved in the conflict can form a much stronger connection to the events than simply watching or reading someone else's story. 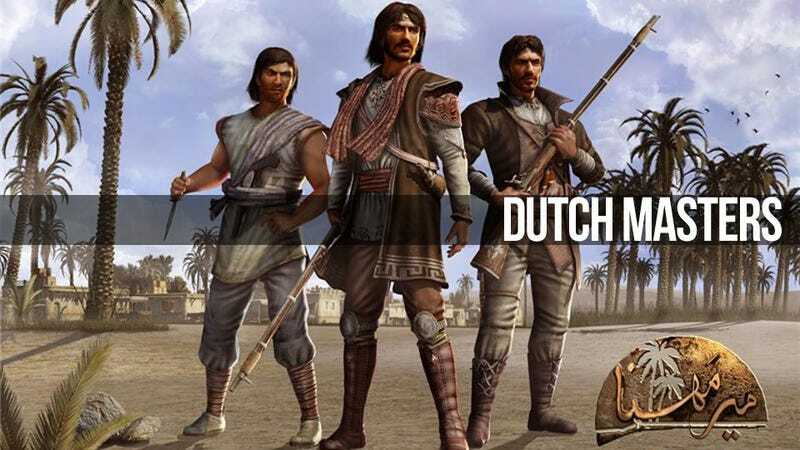 Perhaps Mir Mahna is the game that will cross these boundaries and make that connection, delivering a deeper understanding and appreciation of Iran to the world at large, and more than two hundred years after his defeat of the Dutch the Amir of Kharg can become a national hero all over again.